If you’re attending Cannes and wonder who you should be targetting, this year’s Producers on the Move should be added to your list. 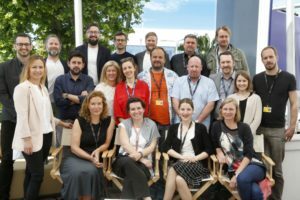 As in previous years, an exclusive group of 20 promising producers was selected for the 2016 edition of the European Film Promotion’s (EFP) networking platform PRODUCERS ON THE MOVE (May 14-17) at the Cannes Film Festival. Considered the most promising young producers from all over Europe, they are currently taking part in a programme designed to facilitate the possibilities for exchanging experiences and joining forces for new trans-national co-productions. The EFP also included a case study on “Producing with SVoD platforms Netflix and HBO”, reflecting the new reality of the business, where online platforms will play a larger role. Danish producer Jesper Morthorst (“Rita” for Netflix) and the Czech Republic’s Tomáš Hrubý (“Burning Bush” for HBO) will share their expertise with the participants and discuss the challenges of this ongoing change in the film exploitation chain. Financial backing for the high-profile event comes from Creative Europe –MEDIA Programme of the European Union and the respective EFP member countries. Find out more about the EFP.